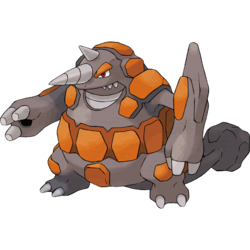 Rhyperior in game: 629 Who? Important notice! Pokemon Rhyperior is a fictional character of humans. Rhyperior (Japanese: ????? Dosidon) is a dual-type Ground/Rock Pokémon introduced in Generation IV. A Rhyperior first appeared in the main series Challenging a Towering Figure! under the ownership of Palmer. 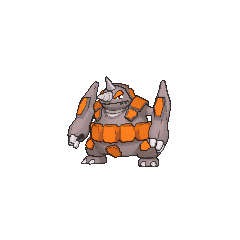 Using powerful attacks like Megahorn and its signature move, Rock Wrecker, it battled and defeated Ash's Grotle, even though Grotle swallowed its own Energy Ball to power up its moves. Another Rhyperior appeared in Piplup, Up and Away!, under the ownership of a Trainer. A Rhyperior owned by Forrest appeared in SS025, where it was used to battle against Nurse Joy and her Latias. However, the Eon Pokémon defeated the Drill Pokémon. A Rhyperior appeared in A Fork in the Road! A Parting of the Ways! under the ownership of a Pokémon hunter. A Rhyperior appeared in Analysis Versus Passion! under the ownership of Remo. 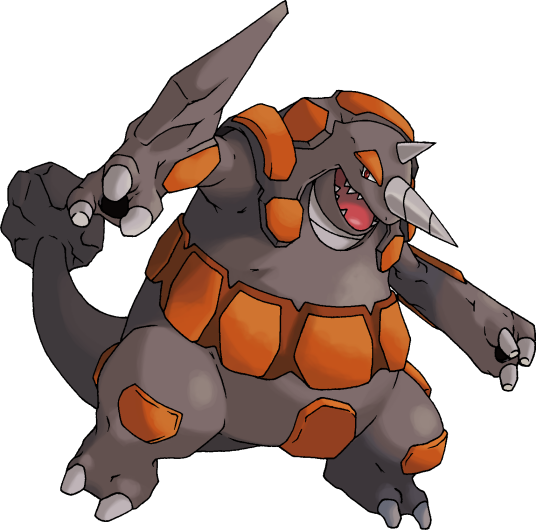 Rhyperior first appeared in a short cameo appearance in the opening sequence of Giratina and the Sky Warrior, under the command of Brendan. A Rhyperior appeared in the opening scenes of Zoroark: Master of Illusions. A Trainer's Rhyperior appeared in The Journalist from Another Region! participating in the Pokémon Sumo Tournament. 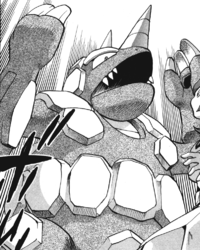 A Rhyperior appeared during a flashback in The Redemption as one of the many Pokémon fighting in the great war of Kalos, 3000 years previously. Sometime before the HeartGold & SoulSilver chapter, Blue traded Silver his Rhydon after learning how to evolve him with a book written by Giovanni. He remained on Silver's team until sometime before the events of the X & Y chapter, where he was returned to Blue. In Pokémon Diamond and Pearl Adventure!, Saturn has a Rhyperior that he uses to battle Hareta at Lake Valor. It triggers rockfalls and composes fissures to attack. It appears to draw much of its inspiration from a rhinoceros, aspects of various dinosaurs (such as ceratopsids and Ankylosaurus) and a tank. Its overall appearance also resembles a miner. Dosidon may be a combination of ? do (ground/soil), ? do (anger), or ? do (prefix that makes a noun sound stronger), ?? sai (rhinoceros), and don (Ancient Greek for tooth, commonly used in the names of dinosaurs). Cantonese Chinese ???? Chiutitbouhlùhng Same as Mandarin name. Mandarin Chinese ???? / ???? Chaotiebàolóng Literally "Super iron Tyrannosaurus".